XLR8R:"... Reflective, a beautiful, progressive, and melodic house cut..."
iDj:"... a shuffling affair that would be equally on weary 6am dancefloors or at the post-chilling session." genres and done in fine fashion." Technasia:"great album! digging some of the tunes"
Tony Humphries:"Definitely some hot tracks to play"
DJ Deep:"it sounds really nice, congratulations!" Lauren Lane:"I'm a big fan of your work... Congrats." Norman Weber/Luna City Express:"Super album!! Congrats, will def play some of the tunes!" Eelke Kleijn:"Couple of great tracks here, congrats on the album release." Benjamin Damage (R&S Records):"Really good"
The Mekanism:"Love the Lp !! great job"
Patrick Kunkel:"very cool, great tracks!" Mihai Popoviciu:"will try visionnaire and leave behind!" Larry Cadge has long displayed his propensity for discerning electronic music. After years as a producer and a label owner, Larry will release his debut album this November. 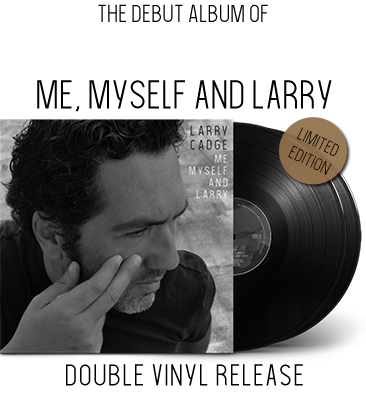 "Me, Myself and Larry", - released, naturally through his own label Smiley Fingers - offers a fascinating insight into the mind of a producer for who we've come to expect a lot from over the past few years. And it's safe to say this one was worth the wait. "the idea to make an album started out like a review of my life, in a way. It was a pretty reflective experience. I had to evaluate not only where I was musically, but also personally". Baring in mind Larry's words, the LP offers an intimate and introspective journey. Featuring 11 tracks, there are moments of electronica, chill-out, house and techno along the way. An intense journey filled with emotion and creativity, Larry Cadge' s debut album is a treat throughout. © 2017 Smiley Fingers - All Rights Reserved.